Wow, how prescient were we to know to repeat the prescience of High Performance Pontiac magazine? Hmm, probably about as prescient as they were to have posted on the new 2009 Pontiac G8 GXP to begin with. But we digress as we're now officially able to tell you all the details on "the flagship" of Pontiac's GXP performance series, the G8 GXP. So what makes this four-door the tip-top of the Pontiac pinnacle of performance? How about the 6.2-liter LS3 engine from the 2008 Corvette? No, that doesn't do it for you? How about a manual transmission? Yeah, we thought so. Hit the jump for the full release and all the details. NEW YORK - Today Pontiac announced the flagship of its GXP performance series, the G8 GXP high-performance sedan, at the New York Auto Show. This 2009 model will join the Solstice, G6 and Torrent GXP models in Pontiac dealerships in late 2008. The G8 GXP takes the G8's responsive driving experience, refined passenger environment and aggressive good looks to a new level. It also delivers an enjoyable driving experience, thanks to a 6.2L V-8 that produces in excess of 400 horsepower. The heart of the G8 GXP is the 6.2L LS3 small-block V-8, currently rated at 402 horsepower (300 kW)* and 402 lb.-ft. of torque (546 Nm)* pending final SAE certification. This engine is the newest member of GM's small-block V-8 family. It features a revised, larger-bore cylinder block, high-flow, L92-style cylinder heads; larger-diameter pistons; unique camshaft and camshaft timing; revised valvetrain with offset intake rocker arms; high-flow intake manifold; and high-flow fuel injectors. The LS3 engine has an aluminum cylinder block with cast-in-place iron cylinder liners. Larger bores help create a 376-cubic-inch displacement. The block casting also features revisions and machining in the bulkheads to enhance its strength and improve bay-to-bay breathing. New pistons were designed for high-rpm performance. New, high-flow cylinder heads aid engine breathing and are based on the large port and valve design found on the LS7 engine and other GM L76 engines. The larger-capacity, straighter intake port-design optimizes intake flow to the combustion chamber, an effect augmented by large valves, measuring 2.16 inches (55.0 mm) on the intake side and 1.59 inches (40.4 mm) on the exhaust side. Pending final testing, the G8 GXP is expected to deliver 0-to-60 mph performance of about 4.7 seconds, and a quarter-mile time of 13.0 seconds at 108 mph. A new six-speed Tremec TR6060 manual transmission is optional on the G8 GXP. This next-generation manual smoothly transfers the engine's power and torque to the rear wheels with a reduction in shift throw. The transmission features a host of refinements including premium gear synchronizers; stronger gears, housing, and bell housing; a single-piece counter shaft; and machined gear teeth. The standard Hydra-Matic six-speed 6L80 automatic transmission is technologically advanced and robust. It uses a clutch-to-clutch operation and an integrated 32-bit transmission controller to deliver smooth and precise shifts. The six-speed has a generous 6.04:1 overall ratio that enables a "steep" first-gear. The result is strong launch acceleration along with "tall" overdrive ratios that lower engine rpms for better fuel economy and reduced noise. A 3.27 final drive ratio comes with automatic-equipped GXPs, and a 3.70 gear is matched with the manual transmission. A limited-slip differential is standard. The G8 GXP rides on the G8's 114.8-inch (2915 mm) wheelbase with wide front ( 62.7 inches / 1,592 mm) and rear ( 63.3 inches / 1,608 mm) tracks. The four-wheel independent suspension is fully adjustable and is tuned for the highest performance in the G8 family. The GXP's ride and handling was developed and validated on racetracks and highways around the world, including the famed Nürburgring racing circuit. It rewards the driver with sharp, immediate responses, as well as a well-balanced road feel during spirited driving. The suspension employs a MacPherson strut design in the front and a four-link, coil-over-shock design in the rear. A direct-acting front stabilizer bar, decoupled rear stabilizer bar and lateral ball joints on the rear suspension deliver increased lateral stiffness for more responsive handling. The front suspension features fully adjustable caster, camber and toe; the rear suspension has fully adjustable camber and toe, for more precise tuning. The steering rate for the GXP is tuned to provide immediate response with definitive driver feedback. Like the G8 sedan and GT, the GXP's steering box is located ahead of the front axle line for a quicker, more direct feel. The Brembo braking system matches the GXP's boost in performance with an equivalent increase in stopping power. The system includes 14-inch (355 mm) vented front and 12.76-inch (324 mm) rear disc rotors, with special quad-piston alloy calipers in front. The alloy calipers on the rear brakes have single-piston actuation. The four-wheel disc brake system includes standard anti-lock brakes and traction control. The GXP rides on 19-inch polished aluminum wheels with a special machined face. Performance-oriented summer P245/40R19 tires are standard, and a comparable all-season tire is available. Combined with the suspension and steering enhancements, this setup gives the GXP exceptional cornering grip. 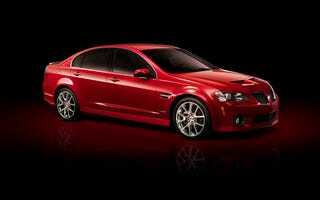 The G8 GXP exhibits strong Pontiac design cues. A unique front fascia with a lower splitter and a distinctive rear fascia diffuser contribute to its sporty look. The dual-port grille, fog lamps, bold wheels and confident, wheels-at-the-corners stance are all unmistakably Pontiac traits. The G8 GXP's interior is driver-oriented with aesthetic and tactile details like instruments with a sporty appearance that match the car's performance. Interior materials consist of satin and chrome trim and high-quality textured materials throughout. The instrument cluster glows with crisp, white light on the primary instruments. Pontiac's signature red lighting illuminates the rest of the instrument panel cluster. The seats offer firm support to hold occupants in place during aggressive cornering. The standard heated leather seats were designed to deliver excellent comfort during long drives. They are available in Ebony or an Ebony/Red two-tone.